After the Revolutionary War, Episcopal churches, earlier established by the Church of England, began to form their own governing body, known as General Convention, with bicameral legislative bodies known as the House of Bishops and the House of Deputies. Today all Episcopal Bishops from all dioceses are included as are four elected clergy and four elected lay deputies from every diocese. It has met every three years since 1786. This was my third General Convention. 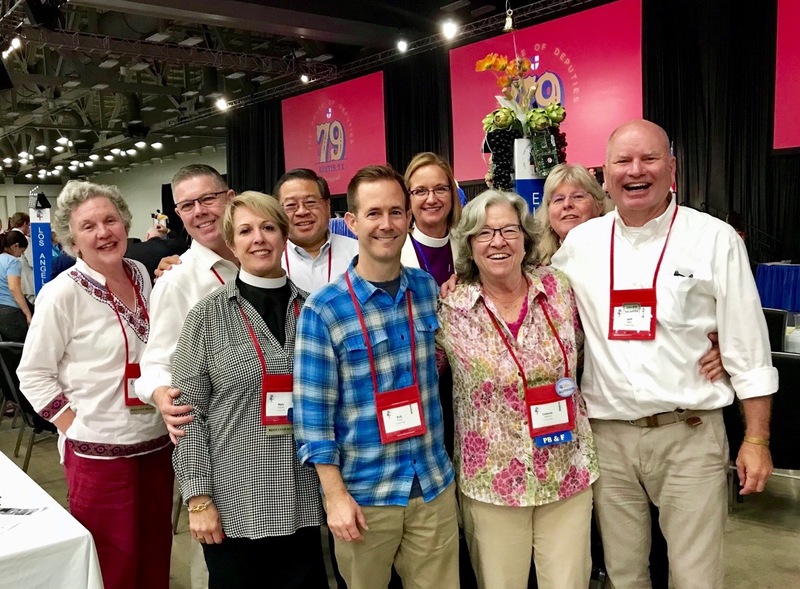 We met, from July 5 through July 13 in Austin, Texas, with representatives from every Episcopal Diocese in the United States, the diocese for the Armed Forces and Federal Ministries, the Convocation in Europe, and Dioceses in Puerto Rico, Central and South America, Micronesia and Taiwan. During Convention, we voted, with great enthusiasm, to reinstate the Episcopal Diocese of Cuba. Please ask if you’d like to know more re: Cuba. -Daily Worship, with 1,000 plus of our nearest and dearest, and extraordinary preaching including the Presiding Bishop Michael Curry. -During an outdoor gathering, Bishops United Against Gun Violence, with the vast majority of our bishops vested, the Schentrup Family, from Parkland, FL, spoke about the death of their daughter, Carmen, a student at Marjory Stoneman Douglas High School. -Hutto Detention Center: Over 800 of us made a journey, via bus, to where ICE detains women. We gathered across a vast field from the Center; however, at one point some of us, probably 400+, decided to walk around the road and gather closer. From the building about a football field away, we could hear banging on metal and see pieces of white paper, being moved up and down the windows, which were about a foot wide and maybe 5’ tall. Their sounds conveyed “We see you” and so, instead of waving back and forth, we began, modeling their movement, moving our arms up and down to let them know “We see you!” The next morning our Chaplain for the House of Deputies, raised in South Africa and now a rector in Laguna Beach, taught us a Zulu greeting: Sawubona which has a deeper meaning along the lines of I see your humanity, I see your dignity, in solidarity, we see the unique you. May we see each other through eyes reflecting Sawubona! Get in the groove with the Celtoids!